CJ loves ice cream, loves it so much that she prays God for ice cream dreams daily. I was inspired by soft serve ice cream post on come together kids and Homemade ice cream on Helping little hands. With few twists here and there to the recipe and ingredients.. Here comes my own version of soft serve ice cream! With an electric hand mixer, whip the half and half until the milk is frothy/foamy. I did the Whipping for about 5 mins. Add the sweetened condensed milk, vanilla extract and mix thoroughly. Whip the mix until frothy again. The mix is little watery but no worries it comes out good when frozen. (I whipped for about 10 mins). Freeze for at least 4 hours. I left it overnight and was pretty hard in the morning. My mom suggested to beat again with the beater. So I left the container at room temperature for 5 mins and whipped until soft(Here you can also use a blender). 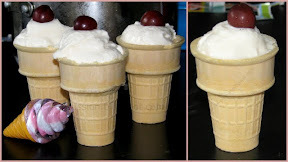 If it becomes watery, freeze again for half-an-hour and enjoy your homemade soft serve on wafer ice cream cones! It tastes yummy, feels creamy and looks so dreamy! Fat free ingredients make you eat guilt free! Hi Heather, I feel glad that you liked it! They're just perfect for the hot summer! If you give them a try please let me know how they turn out. Yum! This version sounds delicious! Mmmmh wow! Sounds delicious! You clever lady!!! And nice to make it quite healthy!! YUM! this sounds so good! I am all about fat-free and this looks as if your couldn't even tell! Thanks for the recipe! I found your blog through a link party. I am your newest follower and would love to have you come check out my blog and follow me too! Thanks! Esther, I love the fact that this recipe is delicious, healthy, and doesn't require an expensive ice-cream maker! I always feel blessed to have you at my linky party! yummy. I will have to try this. Thank you so much for linking up to More The Merrier Monday. I can't wait to see what you come up with next week. wow! that looks yum and healthy too! thanks for linking up! Yum! This sounds so simple and looks delicious. (I'm a big ice cream fan myself! )This is definitely a recipe worth pinning!